I know that I’ve had a lot of recipes on here recently. Maybe that can partly be attributed to the weather — the more time we have inside, the more time I have to do fun stuff in the kitchen, plus it’s not so insanely hot when the oven goes on. Though for the recipe I want to share with you today, you don’t even need to switch on your oven. 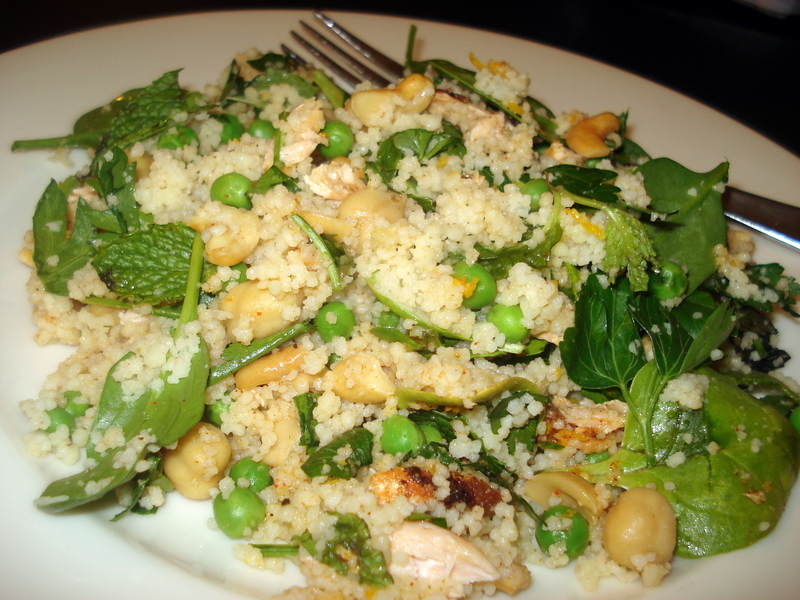 This couscous salad would be great to take to a potluck, and is a nice light yet filling dinner. I got the recipe with a zester from a magazine subscription once. I’ve made a few changes, so here is the modified recipe for you. It’s worth making, trust me. The recipes says that you can substitute chicken for the salmon, and I guess you could, but I thought the salmon tasted pretty top-notch. 1. Combine marinade ingredients in a shallow dish. Marinate salmon. Turn to cover. 2. Bring water and stock to the boil. In a large bowl, pour boiling water and stock over couscous. Cover and set aside for 5 minutes. 3. Combine dressing ingredients. Mix together well. Set aside. 4. To cook salmon, heat a non-stick pan over a high heat. Take salmon out of marinade and pan-fry about 3 minutes on each side, until salmon is cooked through. Add any left-over marinade. Let it sizzle for about 30 seconds. Romove from pan. Let it cool slightly, then flake. 5. Fluff couscous with a fork. Add all other salad ingredients, including flaked salmon. Mix together. add dressing and mix evenly through couscous. ← Should churches care about branding? Yum! Couscous and salmon is a great combo!!! !